0! is a special case that is explicitly defined to be 1. The factorial operation is encountered in many different areas of mathematics, notably in combinatorics, algebra and mathematical analysis. Its most basic occurrence is the fact that there are n! ways to arrange n distinct objects into a sequence (i.e., permutations of the set of objects). This fact was known at least as early as the 12th century, to Hindu scholars. The notation n! was introduced by Christian Kramp in 1808. 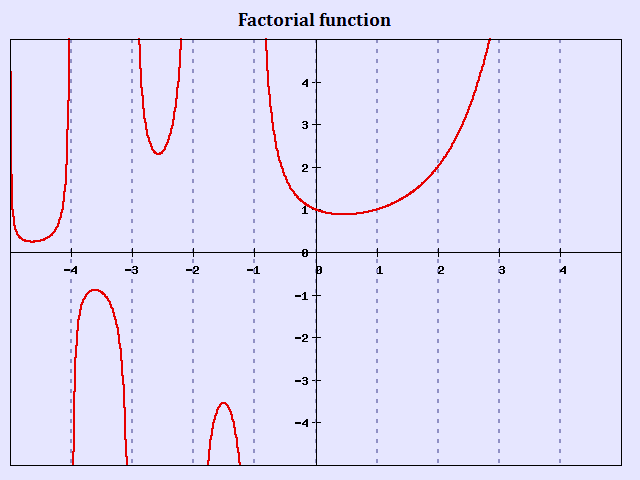 The definition of the factorial function can also be extended to non-integer arguments, while retaining its most important properties; this involves more advanced mathematics, notably techniques from mathematical analysis. * There is exactly one permutation of zero objects (with nothing to permute, "everything" is left in place). * The recurrence relation (n + 1)! = n! × (n + 1), valid for n > 0, extends to n = 0. * It makes many identities in combinatorics valid for all applicable sizes. The number of ways to choose 0 elements from the empty set is More generally, the number of ways to choose (all) n elements among a set of n is . The factorial function can also be defined for non-integer values using more advanced mathematics, detailed in the section below. This more generalized definition is used by advanced calculators and mathematical software such as Maple or Mathematica. Although the factorial function has its roots in combinatorics, formulas involving factorials occur in many areas of mathematics. * There are n! different ways of arranging n distinct objects into a sequence, the permutations of those objects. This number is known as the binomial coefficient , because it is also the coefficient of Xk in (1 + X)n..
* Factorials occur in algebra for various reasons, such as via the already mentioned coefficients of the binomial formula, or through averaging over permutations for symmetrization of certain operations. * Factorials also turn up in calculus; for example they occur in the denominators of the terms of Taylor's formula, basically to compensate for the fact that the nth derivative of xn is n!. * Factorials are also used extensively in probability theory. if and only if p is prime. This fact is based on counting the number of factors p of the integers from 1 to n. The number of multiples of p in the numbers 1 to n are given by ; however, this formula counts those numbers with two factors of p only once. Hence another factors of p must be counted too. Similarly for three, four, five factors, to infinity. The sum is finite since p i can only be less than or equal to n for finitely many values of i, and the floor function results in 0 when applied for p i > n.
The only factorial that is also a prime number is 2, but there are many primes of the form n! ± 1, called factorial primes. All factorials greater than 0! and 1! are even, as they are all multiples of 2. Also, all factorials greater than 5! are multiples of 10 (and hence have a zero as their final digit), because they are multiples of 5 and 2. As n grows, the factorial n! becomes larger than all polynomials and exponential functions (but slower than double exponential functions) in n.
Hence log n! is Θ(n log n). This result plays a key role in the analysis of the computational complexity of sorting algorithms (see comparison sort). Computing factorials is trivial from an algorithmic point of view: successively multiplying a variable initialized to 1 by the integers 2 up to n (if any) will compute n!, provided the result fits in the variable. Interestingly, the factorial is often used as an example to illustrate recursive functions, while it is not intrinsically any more or less recursive (from a mathematical or computational point of view) than for instance a function computing the sum of the first n terms of a given sequence of numbers. The main difficulty in computing factorials is the size of the result. To assure that the result will fit for all legal values of even the smallest commonly used integral type (8-bit signed integers) would require more than 700 bits, so no reasonable specification of a factorial function using fixed-size types can avoid questions of overflow. The values 12! and 20! are the largest factorials that can be stored in, respectively, the 32 bit and 64 bit integers commonly used in personal computers. Although floating point representation of the result allows going a bit further, it remains quite limited by possible overflow. The largest factorial that most calculators can handle is 69!, because 69! < 10100 < 70!. Calculators that use 3-digit exponents can compute larger factorials, up to, for example, 253! ≈ 5.2 × 10499 on HP calculators and 449! ≈ 3.9 × 10997 on the TI-86. The calculator seen in Mac OS X, Microsoft Excel and Google Calculator can handle factorials up to 170!, which is the largest factorial that can be represented as a 64-bit IEEE 754 floating-point value. The scientific calculator in Windows XP is able to calculate factorials up to at least 100000!. Most software applications will compute small factorials by direct multiplication or table lookup. Larger factorial values can be approximated using Stirling's formula. Wolfram Alpha can calculate exact results for the ceiling function and floor function applied to the binary, natural and common logarithm of n! for values of n up to 249999, and up to 20,000,000! for the Integers. If very large exact factorials are needed, they can be computed using bignum arithmetic. In such computations speed may be gained by not sequentially multiplying the numbers up to (or down from) n into a single accumulator, but by partitioning the sequence so that the products for each of the two parts are approximately of the same size, compute those products recursively and then multiply. The asymptotically-best efficiency is obtained by computing n! from its prime factorization. As documented by Peter Borwein, prime factorization allows n! to be computed in time O(n(log n log log n)2), provided that a fast multiplication algorithm is used (for example, the Schönhage–Strassen algorithm). Peter Luschny presents source code and benchmarks for several efficient factorial algorithms, with or without the use of a prime sieve. The Pi function is certainly not the only way to extend factorials to a function defined at almost all complex values, and not even the only one that is analytic wherever it is defined. Nonetheless it is usually considered the most natural way to extend the values of the factorials to a complex function. For instance, the Bohr–Mollerup theorem states that the Gamma function is the only function that takes the value 1 at 1, satisfies the functional equation Γ(n + 1) = nΓ(n), is meromorphic on the complex numbers, and is log-convex on the positive real axis. A similar statement holds for the Pi function as well, using the Π(n) = nΠ(n − 1) functional equation. There exist however complex functions which are provably simpler in the sense of analytic function theory, and which interpolate the factorial values, for example Hadamard's 'Gamma'-function (Hadamard 1894) which, unlike the Gamma function, is an entire function. However, this formula does not provide a practical means of computing the Pi or Gamma function, as its rate of convergence is slow. Thin lines show intermediate levels of constant modulus and constant phase. At poles , phase and amplitude are not defined. Equilines are dense in vicinity of singularities along negative integer values of the argument. 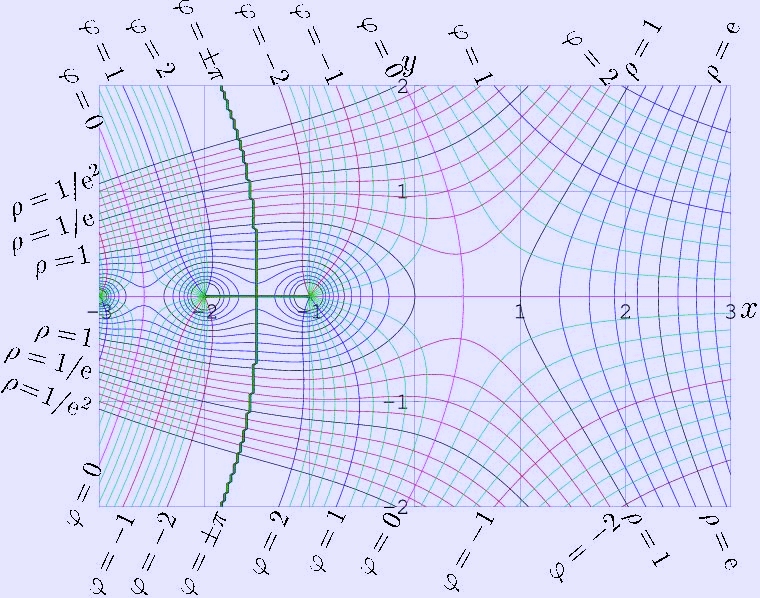 where γ is the Euler constant and ζ is the Riemann zeta function. Computer algebra systems such as Sage (mathematics software) can generate many terms of this expansion. There is common misconception, that log(z!) = P(z) or for any complex z ≠ 0. Indeed, the relation through the logarithm is valid only for specific range of values of z in vicinity of the real axis, while . The larger is the real part of the argument, the smaller should be the imaginary part. However, the inverse relation, z! = exp(P(z)), is valid for the whole complex plane, the only, z in the continued fraction should not be zero, and the convergence is poor in vicinity of the negative part of the real axis. (It is difficult to have good convergence of any approximation in vicinity of the singularities). While or , the 8 coefficients above are sufficient for the evaluation of the factorial with the complex<double> precision. The primorial (sequence A002110 in OEIS) is similar to the factorial, but with the product taken only over the prime numbers. A function related to the factorial is the product of all odd values up to some odd positive integer n. It is often called double factorial (even though it only involves about half the factors of the ordinary factorial, and its value is therefore closer to the square root of the factorial), and denoted by n!!. * (2n − 1)!! is the number of permutations of 2n whose cycle type consists of n parts equal to 2; these are the involutions without fixed points. * (2n − 1)!! is the number of perfect matchings in a complete graph K(2n). * (2n − 5)!! is the number of unrooted binary trees with n labeled leaves. the only known interpretation for the sequence of all these numbers (sequence A006882 in OEIS) is somewhat artificial: the number of down-up permutations of a set of n + 1 elements for which the entries in the even positions are increasing. The expressions obtained by taking one of the above formulas for (2n + 1)!! and (2n − 1)!! 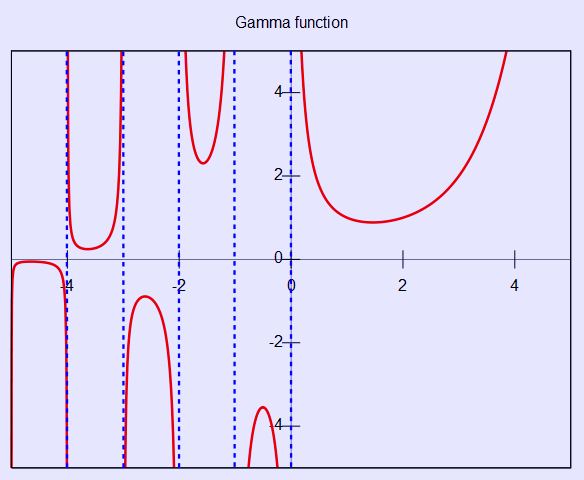 and expressing the occurring factorials in terms of the gamma function can both be seen (using the multiplication theorem) to be equivalent to the one given here. though see the alternative definition below. With the above definition, (kn)! (k) = knn!. In the same way that n! is not defined for negative integers, and n!! is not defined for negative even integers, n! (k) is not defined for negative integers evenly divisible by k.
This last expression is defined much more broadly than the original; with this definition, z! (k) is defined for all complex numbers except the negative real numbers evenly divisible by k. This definition is consistent with the earlier definition only for those integers z satisfying z ≡ 1 mod k.
In addition to extending z! (k) to most complex numbers z, this definition has the feature of working for all positive real values of k. Furthermore, when k = 1, this definition is mathematically equivalent to the Π(z) function, described above. Also, when k = 2, this definition is mathematically equivalent to the alternative extension of the double factorial, described above. 1, 2, 12, 120, 1680, 30240, 665280, ... (sequence A001813 in OEIS). For n = 1, 2, 3, 4, ... the values H(n) are 1, 4, 108, 27648,... (sequence A002109 in OEIS). where A = 1.2824... is the Glaisher–Kinkelin constant. H(14) = 1.8474...×1099 is already almost equal to a googol, and H(15) = 8.0896...×10116 is almost of the same magnitude as the Shannon number, the theoretical number of possible chess games. Compared to the Pickover definition of the superfactorial, the hyperfactorial grows relatively slowly. The hyperfactorial function can be generalized to complex numbers in a similar way as the factorial function. The resulting function is called the K-function. 1. ^ a b Weisstein, Eric W., "Factorial" from MathWorld. 3. ^ Higgins, Peter (2008), Number Story: From Counting to Cryptography, New York: Copernicus, p. 12, ISBN 978-1-84800-000-1 says Krempe though. 5. ^ Peter Luschny, Fast-Factorial-Functions: The Homepage of Factorial Algorithms. 6. ^ Peter Luschny, Hadamard versus Euler - Who found the better Gamma function?. 8. ^ Weisstein, Eric W., "Glaisher–Kinkelin Constant" from MathWorld. * All about factorial notation n! * Weisstein, Eric W., "Factorial" from MathWorld. o Weisstein, Eric W., "Double factorial" from MathWorld. * Factorial Calculator: instantly finds factorials up to 10^14! * "Factorial" by Ed Pegg, Jr. and Rob Morris, Wolfram Demonstrations Project, 2007.